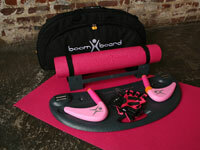 The idea behind the Boom Board Body Shaping System is intriguing: You use your own resistance to build strength. In other words, no need to scatter a bunch of dumbbells around the den. For that fact alone, it’s definitely worth a look. The board looks like a wide, flat semicircle with two handles attached to retracting cables. The right-side handle has a button on the end and a slide in the middle; press the button or push against the slide to adjust the cable. Once you get the length you want, you use the arm opposite the one doing the move to provide resistance. While doing a bicep curl with your right hand, for example, the tension is provided by your left hand. Once you get the hang of it (it doesn’t take long), it works quite well. I could really feel my muscles working, and I liked being able to adjust the resistance by just changing the force I was exerting on the opposing handle. The board comes with a booklet that shows you how to do a variety of basic exercises. Although the moves are solid, they don’t indicate what parts of your body are being targeted, so it would be difficult for strength-training newbies to pull together a balanced, full-body workout from it. The board also comes with a 15-minute DVD workout, led by a big hunk of eye candy named Sebastian Seigel. While I was automatically disposed to like him because he appeared in a couple episodes of Lost (my favorite show) last season, he’s an actor/athlete, not a trainer—and it shows in the workout. He gives very few form tips, and indeed, his own form on many of the moves is questionable (for example, his knee moves past his toes in the lunge moves, an excellent way to mess up your knees). Seigel also gives no time between moves to allow you to adjust the cable length. His female counterpart, as well as the back-up people, occasionally look to be doing a different move than he is. The overall effect is rather confusing (and, again, not very helpful when it comes to scouting for proper form). You also get two other noteworthy things with the board: One is a door “module,” aka a frame that fits along the bottom of the door to hold the board in a vertical position, allowing for “advanced abdominal use.” The problem is, it doesn’t come with any exercise suggestions, so you’re left to make up your own moves. The second is a seven-day meal plan. It’s basic and somewhat boring but seems healthy enough. Beware the low calorie count, though—1,200 calories isn’t something you want to stick with for the long haul unless you’re a pretty small person to begin with. Most folks need a little bit more for a long-term diet, especially if they’re working out as well as cutting calories. The bottom line: The board is a fine way to build muscle, but not a good choice if you’re looking for guidance during your workout. I also wonder about the durability of the plastic handles. Add to that the somewhat steep price tag, and I think I’ll just stick with my dumbbells. Pros: The make-your-own resistance cable provides a good strength workout at a range of intensities, and the board is easier to store than a bunch of dumbbells. Cons: The DVD is hard to follow—the instructor transitions too quickly from move to move and pays little attention to form. Also, it’s expensive, and there are no exercise instructions to go along with the door module. Extra tip: If you decide to attempt the DVD, you’ll definitely want to become familiar with the moves ahead of time (using the book) and keep an eye on your own form.